Avatar is the new Star Wars for this generation of digital filmmakers. The visual fourth wall has just been shattered inviting the audience to now be in the film they are watching during a 3D IMAX type viewing experience. As a filmmaker and writer, you now have to consider things like Z depth, and how your story can literally reach out and grab the audience from the screen in full 3D glory – every scene. 3D films also make more money (if the visual story is good) and are the hot new thing studios are making. The 3D experience cannot be duplicated as easily with home viewing situations, forcing movie lovers back into the 3D theaters. Avatar is now the highest grossing film ever created and the most expensive. Independent filmmakers can still make 3D films, they just need to focus on doing what 3D does well. Avoid using highly detailed photo realism visual styles that require long set up and rendering times. 1) Original 3D Characters – You can create any character you can imagine in 3D. This is the biggest sell point of this very time consuming animation style. People want to see things they have not seen before, or in a drastically new way in 3D animated films. 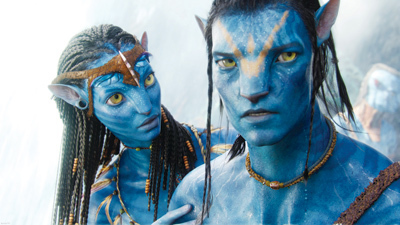 Avatar hooks us visually and emotionally using 11 foot tall blue skinned native catlike beings with tails. They do extreme feline like stunts moving through a 3D alien jungle space in a fun to follow visual way. 2) Original 3D Sets – Any location that you can imagine, you can build in 3D. What set have you always wanted to see? Avatar show us a jungle utopia on a distant planet with tree gods. 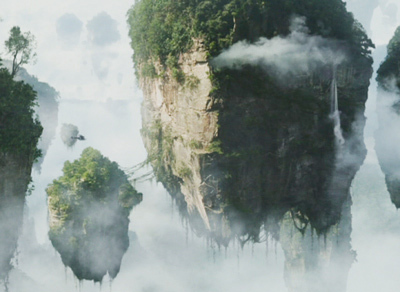 Avatar shows us floating tree covered islands hovering in space. These are great for the catlike people to climb around on and do extreme parkour type shots across the 3D terrain. We relate to this setting in part because it is based on actual mountains in China that do not float. 3) Traveling 3D Shots - 3D cameras can go anywhere. They are particularly good at moving through never before seen environments, unencumbered by needing dollies or tracks for movement. What traveling shot ideas could you come up with using roller coasters, trains, moving character POV’s, death defying stunt move POV’s, space shots, things poking out into the audience, 3D sets wrapping around the edges of the theatre or flying into objects? 4) Image/Camera Mapping – Most 3D programs do a good job of mapping photos or DV, to simple planes or objects, which can then appear as highly detailed 3D elements with lots of depth. 5) Adding digital makeup/Extra body parts – 3D may used as digital make up on actors, or blue screen characters, to add limbs, cut them half or have something like a worm crawl out of holes in their face. 6) 3D Camera Movement – Cameras in 3D software programs can do almost anything. They are especially good at mathematically controlled motion paths, original POV’s and flying through unusual or tight spaces. 7) Realistic 3D Stunt Moves – 3D stunt actors never get hurt or complain. Blowing 3D models up is much cheaper then destroying real cars or buildings. How could you create a 3D enhanced POV stunt shot for your film that is too dangerous to do in real life? 8) 2D Characters On 3D Planes For Better Animation Controls - The 2D animated show Southpark is done in Maya, by mapping pictures onto flat planes the shape of the images. This allows the character animators to take advantage of the powerful animation abilities in the 3D software to move the parts around more easily than using a 2D package. 9) 2D Cell Shading For Video And 3D Footage - Some filmmakers are shooting on DV then taking the footage into 3D Studio Max or Maya, to take advantage of the 2D shader abilities. A shader is like a filter that renders adjustable visual styles such as looking handrawn. 10) Distorting Actors - Many traditional 2D animated distortion or morphing effects, can be created with an added dimension in 3D. 11) Animated Animals Or Objects - What animals or inanimate objects could you bring to life in your film using 3D? 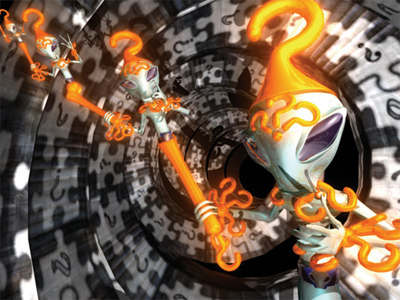 This alien has a talking staff with three smaller versions of himself. 12) Duplication – Once you model, texture map and animate one object or character, it is easy to make copies. Use this to your advantage by making robot armies, twins, gangs, fleets of objects or factories full of workers. How could you make simple variations of one character, to form a group of individuals, by modifying parameters such as scale, visibility, color, rotation and position on individual body parts? 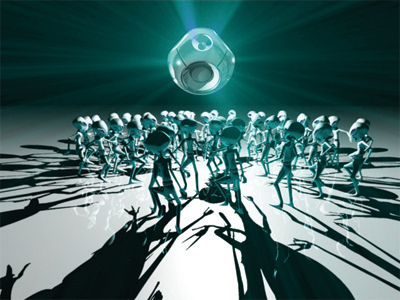 Once you have one dancing alien it is easy to duplicate and make a whole party of dancing aliens. 12) Flocking Systems - Flocking is the ability to animate large groups of objects or characters in a natural looking way. 13) Physics - Many 3D programs allow you to assign properties to objects such as weight, material, velocity and friction. These objects then assume those properties during animations while interacting with other objects. 14) Hair And Cloth – What kind of hairy looking characters or unique clothing could help give your film a signature look? 15) Motion Ride Animation Paths – What kind of POV ride could you take your audience on as part of your film? 3D works great for traveling through spaces in a way DV and 2D animation cannot do. 16) Mixing Animation Styles - Real blue screen actors can be inserted into 3D worlds to save money on character animation and sets. 17) 3D Water, Fire, Smoke, Weather, Plants & Trees – 3D is getting good at doing natural elements and plants. How would the plants and weather look different in your world where you control everything? 18) Outer Space Shots - Space has low geometry (lots of space with round planets), that makes it easy to do in 3D. 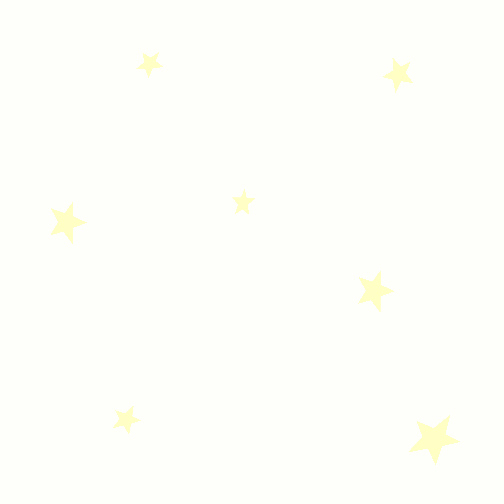 Modeling a simple flying saucer and setting a few motion keyframes against a starry backdrop plane is relatively fast. Taking that spaceship and duplicating it a hundred times gives you a fleet of UFO’s. How can you have your story take place in space? How can you create a unique version of outer space? 19) Unusual Texture Maps - Once you have a 3D model, you can place any type of texture map across the surface, which opens up a bunch of metaphorical possibilities for your stories. Avatar features characters with blue sparkly skin and lush jungles. 20) 3D Scanning – Desktop 3D scanners are getting better and cheaper as the technology develops. Almost any object can be 3D scanned. 21) Motion Capture – If character animating is not a thrilling way to spend your time, you could choose to use an actor in a motion capture suit to generate keyframes. There are lots of motion capture files available on the web to plug into your 3D characters too. 22) Z Depth Wow Shots – Study what works best in 3D by watching Avatar in a 3D Imax theatre. Thin things poking out into the audience from the middle of the screen look more 3D then big thick objects. Sets that wrap around the outside edges of the screen with 3D elements extend the film world into the audience. Little firefly looking jellyfish creatures who hover in the middle of the theatre add lots of depth and pop out off the screen. 22) Free 3D Internet Models – Google any type of model and find ones online ready to go for free. Plan your story around what you have or can find if you are doing the movie yourself. 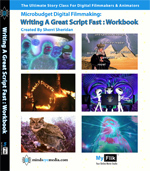 More information about writing for 3D can be found in the new DVD Workshop Writing A Great Script Fast. How could you think of a 3D element for each of the basic 40 plot points presented in this sample movie from Writing A Great Script Fast?